A goodwill tour of Poland escalated into a stand-off between Moscow and Warsaw after Russia’s culture minister gave a combative interview on state TV concerning the removal of a Soviet war monument, leading to the sacking of its Polish producer. Minister of Culture Vladimir Medinsky was in Poland this week to lay flowers at the Sobibor extermination camp to commemorate Holocaust Memorial Day. The outspoken politician, who rose to fame as a best-selling nationalist historian before being appointed to his post four years ago, was then invited to appear on a talk show at the country’s public broadcast channel, TVP, on Wednesday. 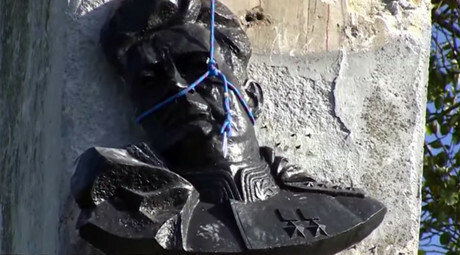 Presenter Maria Przelomiec questioned the minister over last year’s removal of a memorial to Soviet General Ivan Chernyakhovsky that had been located in the Polish town of Pieniężno, accusing the general of “ordering the killings of Polish resistance fighters” in 1944. The monument had already been in the headlines of both countries following a statement by the mayor of Pieniężno, in which he called it “scrap metal.” Moscow subsequently lodged a diplomatic complaint condemning its dismantling. Chernyakhovsky was the Red Army’s youngest general in World War II. He died at the age of 38 in February of 1945 after suffering a lethal wound in combat, prompting Winston Churchill to send a message of condolence to Joseph Stalin. However, in Poland he is accused of being responsible for as many as 8,000 deaths. “What, personally with a gun?” the Russian politician retorted. The presenter clarified that her grandfather had been arrested “at his order,” and then moved to urgently wrap up the segment. Medinsky again reiterated that Chernyakhovsky had not led any secret plots against the anti-Nazi resistance fighters in Poland – a hotly-contested episode of history between the two countries. As Przelomiec signed off and rose to walk away with a contented smile, a visibly frustrated Medinsky complained “You didn’t let me finish,” ending the show on rancorous note. Medinsky later claimed that, off-camera, Przelomiec had explained that her grandfather died “decades after the war in a Siberian Gulag” and admitted that she had been “exaggerating for effect” when she accused the Russian general directly. The episode would have ended right there as standard-issue squabbling over history between the two neighbors, had the producer of Przelomiec’s show not decided to send a public letter of apology to the Russian minister. The Russian ministry of culture has now criticized Polish TV for“cynical censorship” and offered Czunkiewicz a job as expert in an organization dedicated to building ties between Poland and Russia. Medinsky, who has returned to Moscow, has tried to make light of the whole affair. “This overblown scandal vividly illustrates the scale of the information war that Polish media are waging against Russia,” he said during an interview on Rossiya 1 on Saturday.